Construction of the new show room at the SCHNEEBERGER headquarters started in 2017. It has now been commissioned in 2018. The new, well-lit space fits seamlessly into the existing company building. The 400 m2 exhibition area is now able to present the newest generation of our grinding machines. The new space will also be used for customer training and application development. The base plate was generously designed to carry the heavyweights from our machine range, as well. The most modern cooling, heating, and air cleaning technology combined with LED light installation ensures a pleasant environment. To supply the machines installed in the demo room with cooling lubricants, power, and compressed air, 12 pumps with 24 connection spaces including power boxes and supply tubes were installed. 230 volt power and LAN outlets are also integrated in the GIFAS boxes. The central supply units, compressor, and coolant filter system are integrated with the newly built basement, and the supply hoses and tubes lead into the ground floor through corresponding openings. 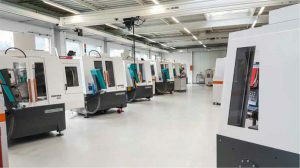 This installation enables speedy, simple connection and smooth supply of maximum 24 grinding machines. The clean oil tank has a capacity of 3,000 litres and features a battery of 16 cartridges for pre and end filtering. The two separate pressure circuits for process and motor cooling generate 17 and 5 bar at a volume flow of 250l/min for process and motor cooling.